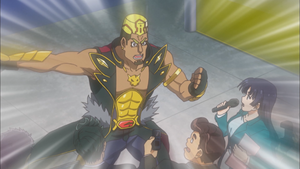 "Man Who Gave Up Charisma" is the fifty-first episode of the Yu-Gi-Oh! VRAINS anime. It first aired in Japan on May 9, 2018. The Gore, who is now working as a bounty hunter for SOL Technologies, manages to find Playmaker and Ai. The Gore then attempts to Duel Playmaker. However, Soulburner then blocks the Gore's path. In order to protect Playmaker, he challenges Gore to a Duel. Gore activates his Skill "Dinowrestle Revolution", activating "World Dino Wrestling" directly from his Deck. While Gore controls a "Dinowrestler" monster, Gore and Soulburner can only attack with one monster each Battle Phase. If a "Dinowrestler" Gore controls attacks Soulburner's monster, Gore's monster gains 200 ATK during damage calculation only. Gore Normal Summons "Dinowrestler Capoeiraptor" (1800/0). Gore activates the Continuous Spell Card "Dinomuscle", increasing the ATK of "Dinowrestle" monsters Gore controls by 400 ("Capoeiraptor": 1800 → 2200 ATK). Soulburner activates the effect of "Salamangreat Meer" in his hand, sending a "Salamangreat" monster from his hand to the GY to Special Summon it (800/600). He sends "Salamangreat Falco". Soulburner activates the effect of "Falco" in his GY, returning a "Salamangreat" monster he controls to the hand to Special Summon it (1200/1600). He returns "Meer". As "Meer" was added to Soulburner's hand other than his normal draw, he activates its effect, Special Summoning it (800/600). Soulburner Normal Summons "Salamangreat Jack Jaguar" (1800/1200). Soulburner uses "Meer", "Falco", and "Jack Jaguar" to Link Summon "Salamangreat Heatleo" (2300/↙↑↘) to the Extra Monster Zone. As "Heatleo" was Link Summoned, Soulburner activates its effect, shuffling a card in Gore's Spell & Trap Zone into the Deck. He shuffles "Dinomuscle" ("Capoeiraptor": 2200 → 1800 ATK). As "Heatleo" was Link Summoned, Soulburner activates the effect of "Jack Jaguar" in his GY, shuffling a "Salamangreat" monster in his GY to Special Summon it to a zone "Heatleo" points to. He shuffles "Falco" and Special Summons "Jack Jaguar" (1800/1200) to the zone the bottom-left Link Arrow of "Heatleo" points to. Soulburner Sets a card. "Heatleo" attacks "Capoeiraptor". As "Capoeiraptor" is in Attack Position, it cannot be destroyed by battle. The attack continues (Gore: 4000 → 3500 LP). As "Capoeiraptor" was attacked, it is changed to Defense Position at the end of the Damage Step. As "Capoeiraptor" is in Defense Position, Gore activates its effect, Special Summoning another "Capoeiraptor" from his Deck (1800/0). Gore Normal Summons "Dinowrestler Capaptera" (1600/0). Gore uses both copies of "Capoeiraptor" and "Capaptera" to Link Summon "Dinowrestler King T Wrextle" (3000/↙↓↘) to the Extra Monster Zone. As "Capaptera" was sent to the GY as a Link Material for the Link Summon of a "Dinowrestler" Link Monster, Gore activates its effect, making that Link Monster gain 1000 ATK until the end of the Battle Phase of this turn ("King T Wrextle": 3000 → 4000 ATK). "King T Wrextle" attacks "Heatleo". The effect of "World Dino Wrestling" increases the ATK of "King T Wrextle" by 200 during damage calculation only ("King T Wrextle": 4000 → 4200 ATK). When "King T Wrextle" attacks, Soulburner cannot activate Spell/Trap Cards until the end of the Damage Step. The attack continues (Soulburner: 4000 → 2100 LP). This page was last edited on 13 September 2018, at 03:49.